"I AM COMPASSION" RHODONITE'S MALA BEADS - It is Believed that Rhodonite's stones promote relaxation, brings a sense of well-being & self love. Aid in emotional balancing, grounds energy & balances the Yin and Yang. HANDCRAFTED WITH LOVE - Each Bead is Hand Knotted and Threaded on Durable Cotton String for Extra Strength. Slip the toggle through the hardware loop for closure and attach the tassel to the hardware loop or anywhere you desire. Wear it as a double wrap short Necklace or traditional long Necklace, or Wrap it Around your Wrist 4-5 times Loosely and Wear it as a Bracelet. One Size Fits All. SATISFACTION GUARANTEED!!! - We Made Each And Every MeruBead Necklace with Love and Passion, and We Hope You Love it As Much As We Do - In The Rare Case You Are Not Happy - We Will Gladly Refund Your Payment in Full For Up To 90 Days! WHAT'S INCLUDED ? 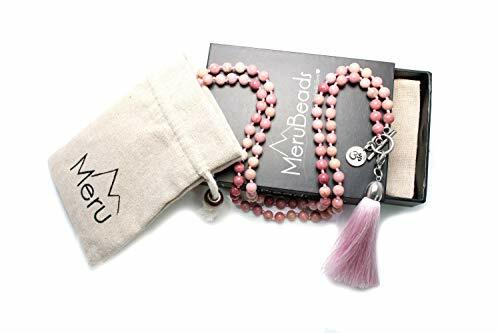 - Inside the Beautiful MeruBeads Box You Will Find A Gorgeous 100% Inspected Handmade Mala Bead With a Silk Tassel Protector, Carefully Packed in a 100% Cotton Carry Bag - For You to Keep Your Mala Bead Clean and Safe. Enclosed is A Mantra Card "I AM COMPASSION" for the Rhodonite MeruBeads Version Necklace. Sterling Silver Twisted Blade Intricate Lapis Bead Bracelet 8"
Gold Plated Heart Necklace I Love You to The Moon and Back Pendant 24k Gold Purple Cubic Zirconia, 18"